Nourishment for your muscles before any workout. PUSH YOURSELF TO THE LIMIT, BUT STAY CLEAN. Pre-workout drinks give you the ultimate boost. But all those chemicals, unsafe stimulants, and artificial flavours? No thanks! We combined 3 amino acids with extra BCAAs, caffeine, and pepper to create our completely natural booster. So you can push yourself to the limit. Without burning out your synapses. "I never would’ve thought that combining BCAAs and L-Citrulline could pack such a punch." "You almost feel like you’re about to take a really important exam. Your whole body tingles and you feel really focused. Two thumbs way up!" OUR AMINOS HELP YOU TAKE YOUR TRAINING TO THE NEXT LEVEL. Start your workout before breaking a sweat. True success starts in the head. And finishes in the muscles. Push yourself further with our perfectly tuned energy complex. Made from 100% clean ingredients. Give your workout that extra push. Give your muscles the aminos they crave. Switch your head into power mode. A clean kick or a ton of chemicals? Add 1 measuring spoon of Energy Aminos powder (approx. 20g) to 400ml of water. Drink! The Energy Aminos should kick in after approx. 20 min. Start your workout! Dietary supplement. 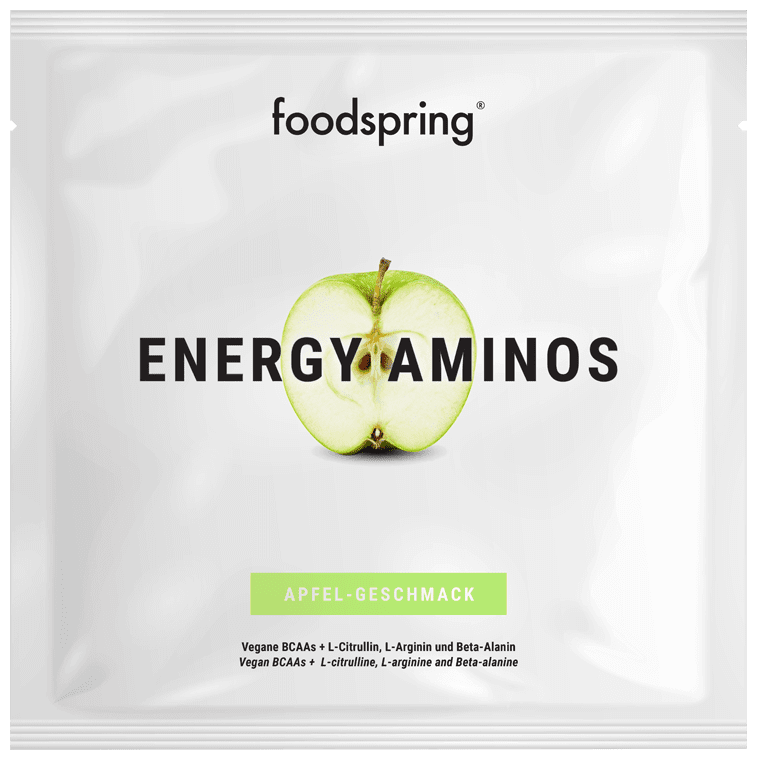 Amino acid mixture with apple flavour. With sweetener. Contains caffeine and guarana extract (200 mg caffeine per portion). Not recommended for kids and pregnant women. Une performance optimisée en 3 étapes. Ajouter 1 cuillère doseuse de poudre Energy Aminos (env. 20 g) dans 400 ml d'eau. 3. Boire. L'Energy Aminos fait effet au bout de 20 min. Votre entraînement peut commencer. Dissolve 1 portion (20 g = 1 measuring spoon) in at least 400 ml of water and drink 20 minutes before your workout. A free measuring spoon is included in each tub. Why are your Energy Aminos so clean? We want you to get the most out of each and every workout. We created the cleanest pre-workout booster on the market so your body can get the exact nutrients it needs to smash really intense workouts. L-citrulline and plant-based BCAAs. Caffeine from the guarana plant. And don’t forget the pepper extract – our natural kick. Why does my skin start to tingle after I drink Energy Aminos? Don’t worry, the tingling is completely harmless. Actually, it's good for you! The source of that pleasant tingling sensation is beta-alanine. Beta-alanine is an amino acid that stimulates your muscles and supports your workouts. It's normally only found in meat, but our beta-alanine is completely vegan. This means that even vegetarians can enjoy our Energy Aminos. And what should I drink after a workout? The most important things to consume after a workout are simple carbohydrates, BCAAs, and L-glutamine. You want to recover properly before you get going with your next session. Our Recovery Aminos make the all-important post-workout phase totally clean. We only use completely clean vegan BCAAs and absolutely no flavors. Are the Energy Aminos also suitable for women? Of course! Because instead of building up a specific type of hormone, our Energy Aminos are completely clean. Our BCAAs are all natural and plant-based. This means we’ve got all your body’s essential amino acids covered, but we keep it totally vegan. Perfect for intense workouts. 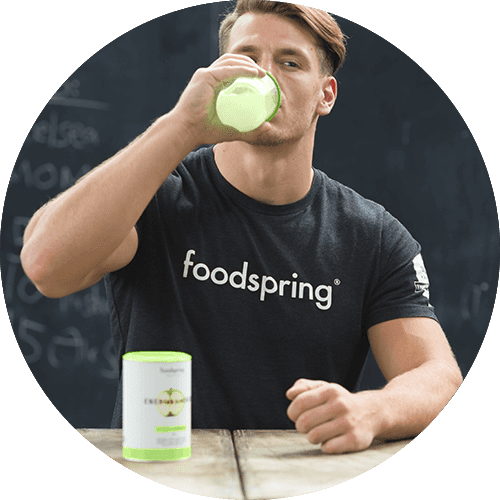 Why do other boosters say they have better nutritional values? Better nutritional values? Only on the label. After all, your metabolism can only make use of a certain amount of nutrients in a single day. The rest is simply wasted. 20g of our Energy Aminos per training day are perfect during your most intensive exercise phases. This will give your muscles more than enough energy without overloading or overwhelming your body. Energy Aminos To Go will be back in stock shortly.